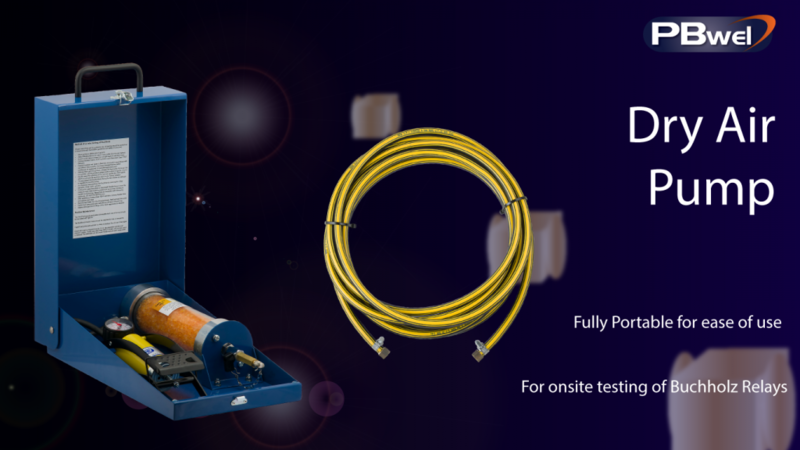 The Dry Air Pump provides a portable solution for on-site testing of Gas and Oil operated Buchholz relays. A charge of air is created in the polycarbonate cylinder by means of a foot-operated pump. The Dry Air Pump cylinder contains an indicating silica gel, which then absorbs the moisture present in the air. The pressure of the air charge is monitored on the built-in pressure gauge. When a suitable pressure has been attained, the air charge is then quickly passed to the Buchholz via a flexible tube, by opening the ballvalve fitted to the cylinder. To prevent backpressure forcing oil back down the flexible pipe, a non-return valve is incorporated in the unit. The indicating silica gel is a crystalline material, which absorbs moisture readily. The properties of the crystals can easily be regenerated by heating/drying. The crystals are impregnated with Iron compounds, which give them an orange colour. Upon absorption of moisture these crystals change from their orange colour to a pale yellow and then become colourless. When the crystals change to pale yellow they should be regenerated. This gel is not classified as dangerous. [table] Technical details[attr colspan=”2″] Maximum recommended operating pressure |60 p.s.i.g. Size: |475 x 250 x 128mm. Damaged units should be returned to works for repair/quotation. Spare parts are available ex works.